While looking for some natural alternatives to chemical filled hair products a few weeks ago, I ran across something that said you could use coconut oil as a hair conditioner. I thought this sounded interesting and since I already have a jar of coconut oil on my bathroom sink I decided to test it out! On day one I used a little coconut oil in my wet hair after I towel dried it a bit. I figured that using it in the shower would defeat the purpose and using it when my hair was dry would make it super oily. I just added a little in a little all over my hair, combed it through, and let my hair dry naturally like I normally do. When it dried it was a little greasier than I would have liked but super soft! I also had no fly-aways and my split ends didn’t look quite so bad. On day two it started to look really nice. Yes, the moisturizing lasted through a shower and shampoo and my hair was still soft and shiny, but not quite as greasy as the day before. On day three I even took a pic…. Still super soft and shiny! I finally noticed it wearing out by about the 5th wash. I couldn’t believe it lasted so long! Shiny, smooth, no flyaways, and not greasy. I loved that I still had the affect from the coconut oil for more than one day. Any store bought normal product I would have had to apply again. I will definitely continue using this as my “hair product”. It’s easy. I get to smell like coconut, not chemicals. And I reap the benefits for several days afterwards! 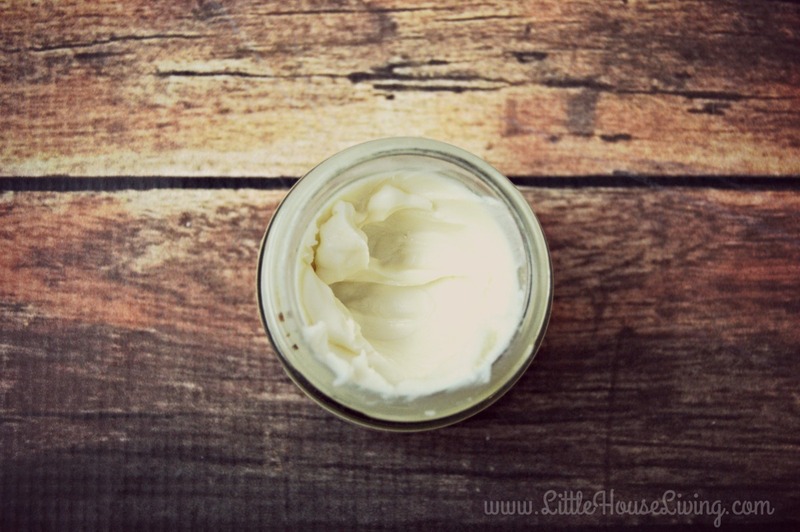 I actually used my Homemade Lotion recipe for this Coconut Oil Hair Conditioner. I figured a little added Vitamin E oil in the coconut oil would be beneficial overall. I also think that this “recipe” is pretty frugal considering you just have to use a tiny amount of the oil and it lasts for a while on your hair. What natural products do you like to use in your hair? 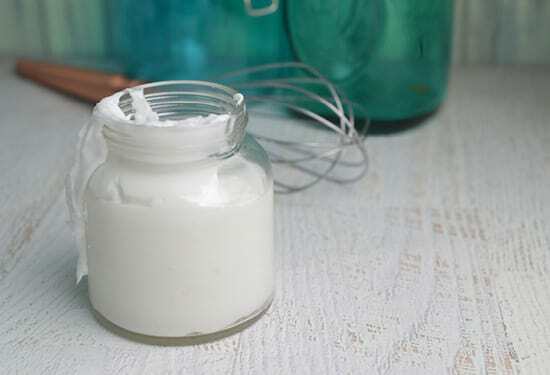 Have you ever tried using a homemade Coconut Oil Hair Conditioner? I’ve recently been experimenting with a baking soda ‘wash’ and apple cider vinegar ‘rinse’ for my hair. I just use about a 1/4 c of baking soda, add some water to make a paste and massage that into my hair. I’ll rinse it out then do the ACV rinse which is 1/4 c of the AC vinegar then enough water to make a cup or so. I pour that on and let it sit a minute or two then rinse. My hair is always very soft afterwards. It can get a little dry if I do it too often so I might try your coconut oil conditioner too and see if that helps. I do that too! And, I always finish with a coconut oil as a hair mask. Leave the oil in for 5 minutes or so, then rinse most of it out. Of course, some always remains, which is fine, as it acts as a frizz fighter & leave in conditioner. Hi! Do you use the whole cup of apple cider/water mix in your hair? I just tried this today for the first time and it took over 5 minutes to brush my hair out. It’s chest length but normal conditioner takes less than a minute. so snarly still I just had to throw it in a bun. Any suggestions?? I also want to try the coconut oil conditioner but need an inbetween conditioner for the days I wouldn’t be putting that in my hair. Thank you!! I used to dye my hair blonde when I was younger but it looked dyed. My mom said to get the straw they used in packing wines and boil it. Use it as a final rinse after shampooing. My hair had so many highlights that no one believed I dyed my hair. Most liquor stores will give t to you free since they dispose of it anyways. Hi! What a great tip! I have recently been reading up on the many uses of coconut oil, and I am sooo going to try this! Great idea! I tried the baking soda and vinegar method for over 3 months with lots of trial and error with the proportions but it never worked out. I am back to shampoo and conditioner. I really miss how smooth my hair was from before, but it was too greasy. Any suggestions on more natural hair wash? Thanks! Perfect! I’ll definitely try this on my dry, curly hair. I’ll probably start using it this weekend so I can have ample time to shower and experiment. Actually, I’ve also been using coconut oil but not as conditioner. I apply it on my skin and use it as moisturizer. Indeed, my skin feels so soft and smooth without having to use chemical filled lotions or skin moisturizers. This is one of the reasons why I love this product. The coconut oil benefits that it gives make me love to use natural alternatives more and more. I like this idea. I have oily hair to begin with though, and you saying day 1 was really oily kind of scares me. Summertime when I am out of school is a good time to try though! Just an idea…you might try putting on the coconut oil a short time before a planned shampooing. Then you wouldn’t have to go through looking oily the first day. Hmmm, I would love to try this. I’ve been using argan oil so far, Pro Naturals Moroccan Argan Oil to make my hair soft and shiny and not as greasy as with other oils. I just noticed this post is pretty old, but in case you haven’t figure it out yet. The best thing to do is to put it on your dry hair an hour or 2 before you plan to shower. Then you get rid of most of the greasiness with that first shampoo. When my hair begain turning gray it went from being silky hair to a wiry, frizzy mess. To tame this I began to put coconut oil on my hair 2 hours before showering, cover it with a plastic grocery sack and then a knit winter cap to hold the heat in. I’ve also stopped washin my hair every day, and shampoo more like every three days. I condition my hair with the oil treatment every second or third shampoo. Works wonders for mature hair as well as on the young. Wish I had discovered this in my twenties. I was wondering if you could add an essential oil to this to change up the scent and if so how much you would recommend adding. Also, I love your website! I haven’t tried it but I’m sure you can. Just add a few drops until it’s scented strong enough for your liking. Don’t add a citrus oil though. I heard that cold pressed coconut oil was best to use. my jar says expeller pressed is that ok or should I look for the other kind? Expeller pressed might be ok for your hair. It just doesn’t have the same minerals and good properties like cold pressed does. I wrote a little more about it here in our Coconut Lotion post. Not to get to of off topic. 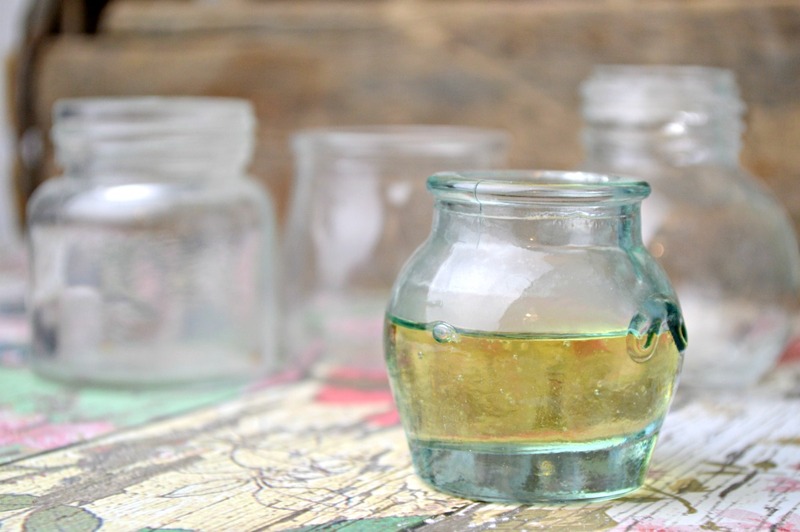 But yesterday I made my own homemade shampoo A recipe that is quite typical with castile soap. Then I made conditioner using coconut oil, shea butter, almond oil, water, vegetable glycerin, and vitamin E oil. I am so discouraged. I feel that the shampoo is too drying and the conditioner is way too greasy. I want to do all natural products, but can’t seem to find something that feels good. Would it be possible to shampoo/condition your hair every other day instead of every day? Or maybe make another shampoo that is more moisturizing and use it one day and the other one the next? I have also used a concoction of castile soap (is definitely drying) but added a little jojoba oil to it. I started out in small amounts at first (1/2 tsp) and went from there. Everyone’s hair is different. Hope this helps with your shampoo. After thought: maybe a capsule of vitamin e.
I just wanted to say that I have been using coconut oil on my hair for quite some time now. I am HIGHLY gluten intolerant, and had to stop using easily available hygiene products (for the most part…). Shampoo and conditioner were my most difficult struggle. I did find great gluten free products from Hugo Naturals, but their conditioners tend to build up on my hair. So, I started applying coconut oil to my hair before I shower and never at the roots. Only from 1/3 of the way down and a little extra on the ends. After I wash, I don’t apply conditioner, and either air or blow dry with a diffuser. My hair comes out super soft either way, and the conditioning lasts a couple of days (I have VERY hard water so conditioning is a little tough!). Thanks for your blog! Great information on here. 🙂 Keep up the good work! 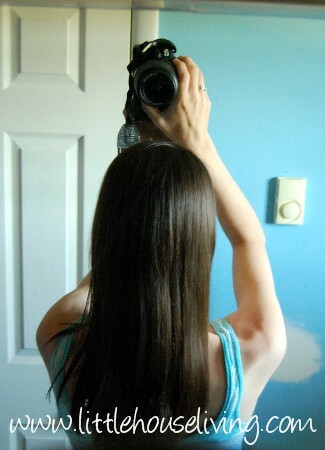 Regarding conditioner, I have long baby fine hair, exactly how much should I use? A dimes worth…a quarter??? I would start by using very very little, it goes a long ways! If you use too much your hair will end up being pretty greasy.